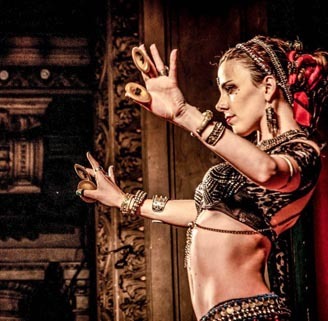 I was a young bellydance teacher and bellydancer (cabaret style) when I discovered ATS® Bellydance. Nobody was teaching this style in my country so I decided to learn it on my own (self taught). Some years later I had the opportunity to travel internationally to take my first official ATS® class at Tribal Pura with Carolena and Megha. I fell in love with them, their philosophy and everything else related to this art form. So I decided that other women in my country should have the opportunity to learn ATS® and make this art form part of their lives. From that moment on I never stopped studying ATS® and following Carolena around the world. I hosted Carolena and Megha for their first time in South America. I have also hosted and studied with the most recognized teachers in ATS®. I am the proud director of Tribal Lady Blue School and Minga!Bellydance Troupe. My background consists of 7 years, and counting, of yoga practice and in my youth many years as a gymnast. I love dancing with people from all over the world and sharing my experience and my passion for ATS® with my students. To this day my dream is to improve my skills, to be loyal to the essence of ATS®, to spread, teach and share this artform with the world.